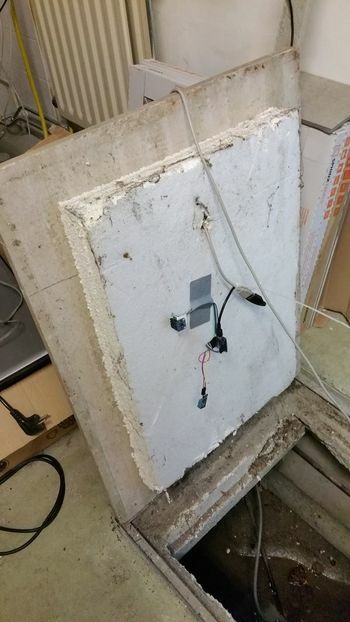 This is a project idea for monitoring the crawl space under a house for water ingress. Basically looking for a nice use case to try out these miniature LIDAR sensors that are now available cheaply (about E8,-). Measurement data is uploaded once an hour over WiFi to an MQTT server. See the bottom graph on this page for live data from a water level meter in the crawl space. Status: we tried it, didn't work really well on raw water surface, probably we need to bounce the laser of something that floats in the water. The range measurement of the VL53L0X module is based on time-of-flight of the laser signal reflecting off a surface. for air-glass, we have n1=1.00 and n2=1.50, the reflection coefficient is 4%. for air-water, we have n1=1.00 and n2=1.33, the reflection coefficient is 2%. A reflection coefficient of 2% is quite low, and indeed some experimentation showed difficulties determining range towards the fluid level in a glass of water. Perhaps a practical way is to measure distance to some floating object instead, like a piece of white polystyrene foam, or a ping-pong ball. We're considering only a ranging offset error in the measurement system. The plan is to use an ESP8266 to read the sensors, connect to the house WiFi and upload the measurement data once an hour. When not measuring, the ESP8266 is put in deep-sleep mode. Time-of-day is retrieved using (S)NTP. This module integrates a VCSEL laser, a photo diode, probably some analog circuitry and a small microcontroller to do digital processing. It has an I2C interface, but it seems you need a library from ST to get an actual meaningful distance out of it. "Increasing the timing budget increases the range measurement accuracy. That is: x N on timing budget => standard deviation / square root of N. For example is the timing budget is increased by a factor of x 2, then the range measurement standard deviation decreases by square root of 2." Taking a measurement after reset requires a couple of initialisation/calibration steps, I need to figure out which ones are actually relevant for my use case. I plan to use the high accuracy mode since measurement time is not very important (doing only one measurement per hour and the run-time is already dominated by other tasks). I think the accuracy can be further improved, e.g. by increasing the measurement time and reducing the sigma limit. According to the remark mentioned earlier, I expect that doubling the accuracy requires four times the measurement time. So for example, I think it should be possible to spend 3200 ms instead of 200 ms on the measurement, which theoretically should give 4 times the accuracy. Using a cover glass on top of the sensor makes things more complicated, so I plan to not use a cover glass. The source code for the measurement application is available on github. I'm using the pololu library for communication with the VL53L0X. As I understand this is not simply a wrapper around the code from ST, but is a kind of reverse engineered code. Total about 5.6 seconds per measurement cycle. Initially, when no WiFi network is known, the sensor starts its own access point presenting a captive portal allowing a WiFi network to be selected. The plan is to encode the measurement data in JSON and post it as text on a MQTT topic. Where id is the ESP8266 unique id (in hex), time is in seconds since 1970/1/1 (UTC), humidity in percent, temperature in degrees Celcius and range in millimeters. The "range" value represents the distance between the sensor and the fluid. A higher range means a lower fluid level. A typical LiFePO4 "AA" (14500) type battery has 700 mAh capacity. An 18650 type battery has approximately double capacity compared to a 14500 battery, about 1500 mAh. Sleep current is estimated to be about 0.15 mA total (about 80 uA for the ESP8266 in deep-sleep, about 50 uA for the DHT11/22, about 5 uA for the VL53L0X in HW standby mode). When awake, current consumption is estimated to take 70 mA on average for 5.6 seconds. This means each measurement takes about 0.11 mAh. So, over one measurement cycle of one hour, total charge consumed sums up to a total of about 0.26 mAh. With a 700 mAh battery this would allow about 2500 measurements, making the battery last about 100 days. This page was last modified on 13 May 2018, at 22:07.